I’ll be the first to admit that I’m guilty of acting like I’m the first one to ever do something. There was that time that I thought I invented avocado toast… and also that time I swore to my friend I listened to Taylor Swift before she was famous. She told me listening to Teardrops On My Guitar on Radio Disney didn’t count, but I digress. Similarly, the ride-sharing app Lyft recently rolled out a new feature named Lyft Shuttle where it has set paths passengers can take instead of direct lines. Does it sound familiar? I mean I could’ve of sworn that I’ve heard of that before.. Somewhere.. Oh yes, THE BUS. Amayzing way of trayvel, reaylly. 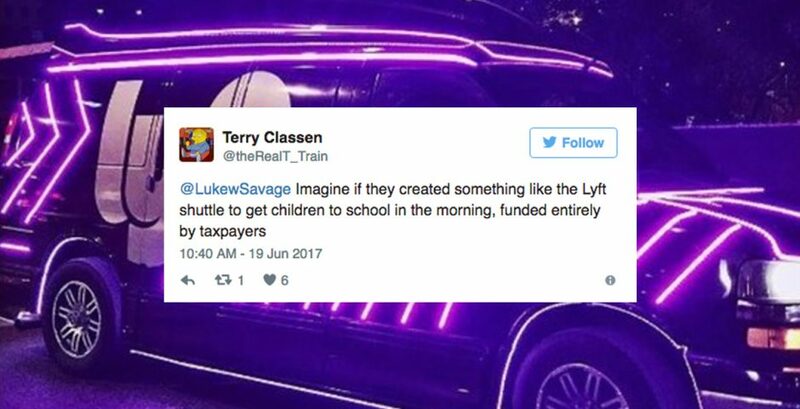 I can't decide what is funnier, Lyft Shuttle or the people outraged at a slightly more expensive bus for slightly richer people. Lyft Shuttle is still funny hours later. This feature is currently being tested out in San Francisco and Boston.